from the book "A Quota of Qualtrough"
Made by Mrs Lil HADDOCK of Karamu, near Hamilton, New Zealand.This beautiful cake in white with blue and red trim was a highlight of the Reunion. 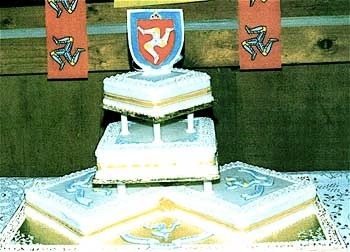 To emphasise the Manx connection, Lil had decorated the cake with the Three Legs of Man symbol. THE IDEA of a family reunion to mark the 120th year of the Qualtroughs' arrival in New Zealand began with Elizabeth Barlow (nee Feisst) and Mary Gavin (nee Schwarz), both of Matamata. Elizabeth and Mary are first cousins once removed; Elizabeth's grandmother and Mary's mother were sisters, daughters of William Qualtrough. Both were keenly interested in New Zealand history and Elizabeth had a special aptitude for genealogy. (She was convenor of the Matamata Group of the New Zealand Society of Genealogists Inc.) In 1976 she had organised a family reunion of her paternal relatives then had compiled a history of the German-American Feisst Russi ancestry. It is pertinent here to delve a little into this background as it relates to the Qualtroughs. Three of William Qualtrough's daughters - Margaret, Annie and Mary ('Bunny') - had married three young men who were cousins to each other. They were Henry Feisst and Ernest and Bruno Schwarz, who had come to New Zealand in 1901 with Henry's father, Herman Feisst. Herman, along with hundredsof young Germans of the 1860's-70's, had emigrated to the United States of America in 1873 to avoid military conscription when Bismarck, the 'Iron Chancellor' was campaigning to unite the divided German states under one flag. Bismarck, a Protestant, encouraged discrimination against Roman Catholics to which faith the Feissts belonged. A pharmacist by profession then a property speculator, Herman settled in Boerne, Texas, married, (Emma Russi) and produced a family of nine sons, two of whom died in infancy. Sadly, Emma developed cancer and died in 1901, leaving a family aged from 16 years down to 18 months old. For some time before her death, Emma had been concerned about the gun-slinging cowboy image of El Paso (where they had lived for the past 10 years) on her eldest boys. She had persuaded Herman that they should move away to a more peaceful environment when the opportunity came. Herman, a prominent Socialist of the idealistic order though engaged in Capitalistic practices, had long been interested in the seemingly Utopian policies of New Zealand's premier, Richard John Seddon. He pulled up stakes once more, this time to the South Pacific. Nephews Ernest and Bruno decided to come also and the all-male contingent arrived shortly before Christmas, 1901. Herman bought land on the Fencourt estate, near Cambridge and in due course Ernest and Bruno went to work for Mr. Wynn Browne to learn New Zealand methods of farming. In due course, too, they married daughters -one each - of a neighbour who was William Qualtrough, (Maggie, Annie and Mary) from which line of descent come Elizabeth and Mary. Elizabeth had been researching the Qualtrough background for some time; the Isle of Man was celebrating its Millenium (1,000 years of unbroken Parliament) in 1979 and sounding bugle calls to the world to rally people of Manx descent for the festivities. Why not a family reunion to co-incide with the Millenium? It was a good, round figure, too, 120 years. Thus Elizabeth, Mary, her sister-in-law Jean Schwarz, of Tirau, Selwyn Haddock of Papatoetoe and Joy McDougall of Auckland made noises along their respective lines of descent to sound out others on the idea. Jean Schwarz had a double connexion - her father was a Cowan and her husband Bob, Willy Qualtrough's grandson. The feedback was tremendously encouraging. Elizabeth became chief instigator and no-one better for the job could possibly have been found. An excellent organiser, she already had so much of the family history at her fingertips. Through her genealogical jigsawing she was, at the time, writing to a distant cousin in the Isle of Man, Violet Corlett, a direct descendant of the mysterious Catherine. What a find.' Violet and Elizabeth became the best of penfriends and set to on a family tree. The first step towards the proposed reunion was to form a committee to help Elizabeth. Hopefully it would be representational of the different branches and comprising members who could work together in contributing their special abilities - and persons who lived near enough to each other to meet without too much difficulty. We don't intend to weary you with a blow-for-blow account of How It Was Done, but an outline of the organisation that made for smooth running might be useful to anyone planning something similar in the future. EUNICE CROSBIE, sharing domestic arrangements. The committee and voluntary helpers were to arrive much earlier on the Saturday morning to put up decorations and displays, set up chairs and pin up directional arrows for facilities and displays. A committee member stood at the doors, too, to welcome arrivals and check that they had the correct colour codes and their name tags on, to answer questions and generally to be helpful. We had worries at times that the function might be over-organised and become bossy and fussy. But the tight organisation paid off in smooth running. The plenty of time allowed for informal mixing kept the atmosphere relaxed and happy. The details of organisation prior to the gathering were the clues - all who were coming HAD to register and pay their fees in advance. Thus we knew exactly how many were coming and how much money we had to spend. Upon registration (families a discount) all were sent their colour-coded nametags, dinner tickets, a map of the locality and reminders of what was and what was not provided as to refreshments and a copy of the programme with"'the words of the Reunion Song printed on the back.